WHY CAN’T ONE SEE THE SCROLLBAR IN DARK MODE? WHY ARE PICTURES SO BRIGHT THAT YOU CAN’T READ TEXT? WHY CAN’T IT REMEMBER YOU LAST LOCATION IN APP? Who knows, who is John Galt? 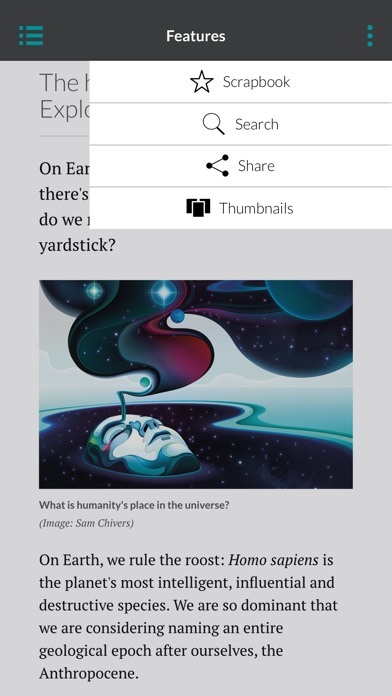 There’s a fatal flaw where the app does not remember your last read article/issue position. Coupled by the fact that the app will check for latest content every now and then and then kick you back to home screen is making reading New Scientist a chore. I’ve previously feedback about this but somehow the developer isn’t listening. Super relevant and engaging content. This is a great app, easy to use and the content is saved on your device so you can view it off line. It will do its own housekeeping by automatically deleting old issues, or not, and you can easily browse through the older issues and download what interests you. I was never any good at science at school - maybe it was the presentation? 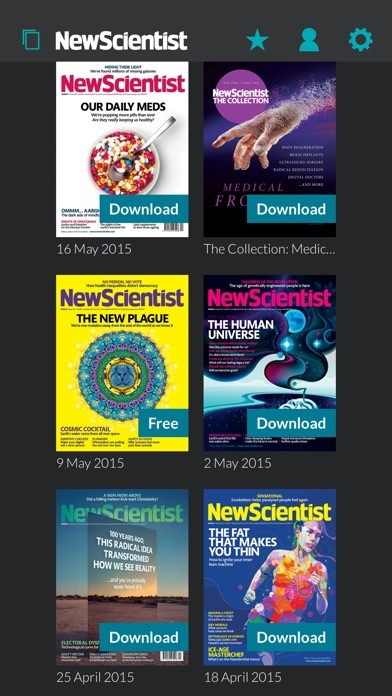 But I just love New Scientist. It’s ideal for picking up when you have a random 10 minutes, or sometimes I binge read several issues. The quirky British humor of the last couple of pages is worth it alone! It’s sort of the People Magazine in format, on a far more interesting level. Everyone who finds it at my house loves it. Totally worth the money. The app does not recognize my signs on so I can use it. I’ve called customer service and IT support and still does not work on my iPad . 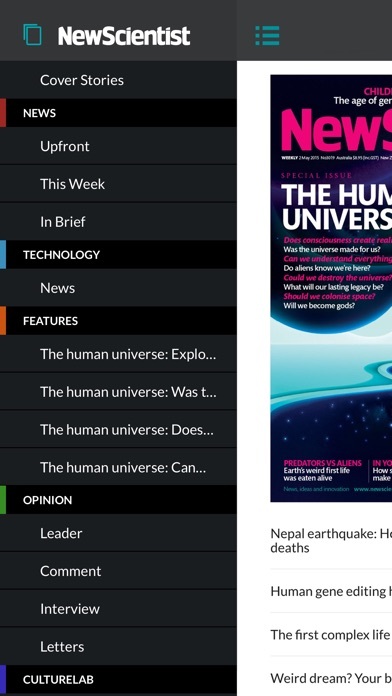 I have a couple of apps for weekly publications. One of them includes and audio version which I can listen to on the move. This app would definitely benefit from a similar functionality. I am enjoying my subscription to the magazine. The articles are well-written and informative. The explanations provided in diagrams and side bars are done well too. I do have several requests. Please consider providing a highlighting feature in a future version of the application, and request the ability to view the pages as they appear in the original text version of the magazine. Thank you. Great mag. Complete app failure. Purchase via iTunes. Trouble logging in each and every time. Customer support was not helpful. Password issues, freezing-up, logging in over and over again. How does a magazine such as this have an app that performs so poorly? Truly disappointed.